In honor of Brain Injury Awareness Month, coming up in March, Florida’s Vocational Rehabilitation shares the success story of Lisa Warthen, who lived through a brain injury and has been given a second chance by business owner Clara Leblac. 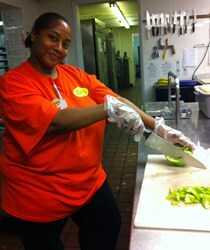 Lisa Warthen, who has an organic brain injury, chopping vegetables at Clara's Tidbits in Jacksonville, FL. We see them as having abilities to help us in our business. We look to what they can do, not what they can’t. Thanks to Vocational Rehabilitation (VR) she is now working for Clara's Tidbits Restaurant and Catering, located in Jacksonville, FL. Honored in 2012 for their commitment to hiring people with disabilities, Tidbits continues to be an outstanding employer partner with VR. Much of Lisa’s success comes from Clara Leblac, owner of Tidbits, who has employed several workers with disabilities during her 30 years in the business. Her relationship with VR started when she needed qualified help for her restaurant and she called the local ARC, an organization that advocates for the rights and full participation of all children and adults with intellectual and developmental disabilities. People with disabilities in search of employment, vendors and Florida employers who are interested in being a part of this uplifting and gratifying experience, are encouraged to contact VR at (800) 451-4327.